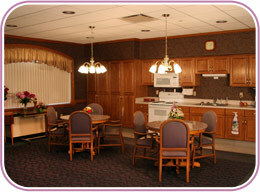 Nelson Manor Basic Care provides a quality living environment. Constructed in 2002, the addition has 13 private and 6 semi private rooms. Bethel Basic Care Services provide an alternative for individuals unable to function in an independent living environment yet not needing skilled long term care services. Nelson Manor has a tastefully decorated family living room with kitchen facilities, a large screen television and a relaxing seating area that is home to many family gatherings. Nelson Manor is located adjacent to our large Activity Center where there is a variety of daily activities and civic events.